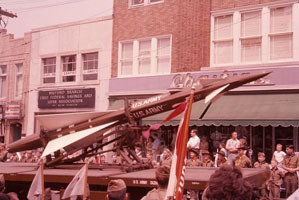 From 1954 until 1974, during the height of the Cold War, Nike Missiles guarded the New York area. The missiles were able to intercept long range Soviet Bear Bombers and destroy them while still over the ocean. 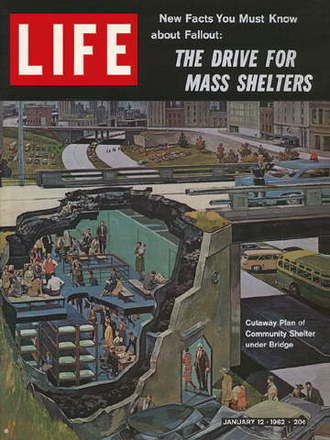 Nineteen Nike Missile sites ringed New York City. 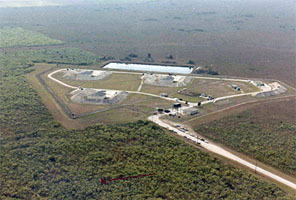 Two of the missile sites and the Headquarters unit were located in what is now Gateway NRA. Fort Hancock (NY-56) and Fort Tilden (NY-49) operated from 1954 to 1974, while Fort Wadsworth was the Headquarters of the 52nd Anti-Aircraft Brigade from 1954 to 1960. During the tense years from 1953 to 1979, the United States Army built and operated close to 300 Nike missile firing batteries in the United States. These missile sites were emplaced as the last line of defense against Soviet bombers. Today, a dedicated group of volunteers works in partnership with the Golden Gate National Recreation Area on the continuous task of restoration at site SF-88, which has been turned into a museum. This valuable historical resource is the only restored Nike missile site in the entire country. It's a great chance for you to see the tools of the Cold War up close. Everglades National Park houses one of the best preserved relics of the Cold War in Florida. Nike Hercules Missile Site HM-69 remains virtually the same as it was when official use of the site was terminated in 1979. Built by the U.S. Army Corps of Engineers, it was completed in 1964 at the height of the Cold War, immediately following the Cuban Missile Crisis of October, 1962. 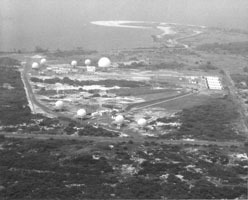 At a time when national security against Soviet attack was America's main priority, the U.S. Army chose this strategic site within Everglades National Park, located 160 miles from the Cuban coast, to build an anti-aircraft missile site. Tom Freitas' web site. Tom was a Spec-5 at Bravo Battery, 2nd Missile Btn, 562 Arty in Fairbanks, Alaska between 1967 and 1968. He was also stationed in Tolchester, Maryland at D Battery, 4 Btn, 1st Arty between 1968 and 1969. Between 1964 and the early 1970s, there were 9 Nike Hercules batteries in the Washington-Baltimore defense area. These Nike batteries consisted of 4 regular Army batteries, 5 National Guard batteries and the headquarters for the 4th Missile Bn, 1st Arty and the AADCP headquarters. Prior to that period, there were a total of 18 sites plus the headquarters and the AADCP headquarters. Charles Carter's website honors the men of the U.S. Army Air Defense Command (ARADCOM) who proudly served in South Florida during the Cuban Missile Crisis and those who followed to stand guard over America's southern shores for the next seventeen years. 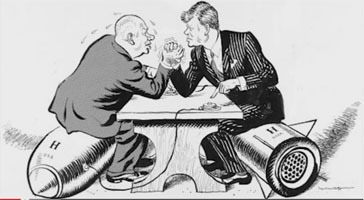 Cold War: L.A. brings together many historical aspects surrounding the Cold War period. Focusing on the Los Angeles area, the Cold War: L.A. web site looks at civil defense sirens, missile sites, and more. Also included is a timeline on special events and topics that were affected by Cold War politics. During the Cold War, it was a very different time in this country. It was a time of national paranoia and fear. In the Los Angeles area, this county's military was looking to protect it, and the west coast, from Russian bomber strikes. Two of these bases were within the borders of the old Rancho La Puente... and we were thankful. From WGRZ-TV (Western New York): A municipal storage site in Amherst, a private business in Cambria, some town facilities in Lancaster, a senior center on Grand Island...and an empty field in Orchard Park. All these places are connected through a portal, which opens to a chapter in American history...down darkened steps...past heavy rusted doors...beyond the bunks still fastened to thick concrete walls, where our defenders once slept. Greg Brown’s LA-88 website. Includes a link to the Col Jack Armstrong page. 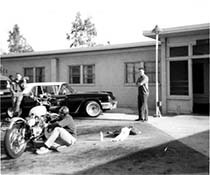 Armstrong was stationed at Ft. Baker at one time and was the Battalion Commander for the regular army Nike sites in Van Nuys during the mid 1960’s. Included are many newspaper clippings and black-and-white official U.S. Army photos from the estate of Col Armstrong. David Procuniar’s Nike Hercules LA-94 website. He has many photos of those who served with him from 1965 to Jan 1968. 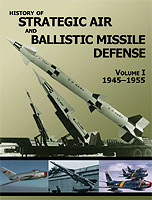 (Aug. 10, 2012) Christopher Bright writes: NIKE veterans and others may wish to know that my book about the development history and deployment of the NIKE and other nuclear air defense arms has just been released in paperback. At $28 this edition of Continental Defense in the Eisenhower Era: Nuclear Antiaircraft Arms and the Cold War is much more affordable than the hardback edition the publisher issued in 2010. 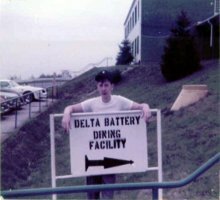 Web site of the original Charlie Battery, 3rd Missile Battalion, 71st Artillery Nike Ajax and Nike Hercules Guided Missile Base. This is the original Charlie Battery Nike Site created in Circa 1957 - 1958. Nike Site Summit is an abandoned Nike Hercules missile site, located on the eastern edge of Fort Richardson adjacent to Chugach State Park and the Arctic Valley Ski Area. In 2009, the U.S. Army, the National Park Service, State of Alaska, and local preservation groups reached an agreement that preserves most of Nike Site Summit and will allow guided tours. Friends of Nike Site Summit will begin restoration efforts in early summer 2010. Site for Nike Hercules missile solders who served in Dichtelbach, Germany. Many people know that Connecticut was home to twelve Nike Missile sites back in the fifties and sixties, but very few people realize that by the end of the sixties some of these sites housed missiles with nuclear warheads on them! John Ramsey's web pages document Connecticut’s Nike Sites. 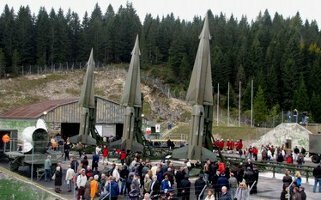 The NATO Nike Base Passo Coe - Monte Torarica (1966-1977) was one of twelve Italian Air Force missile bases in northern Italy defending southern Europe. The city of Folgaria has preserved the Alpha Battery Launching Area as a memorial park. A Battery Control van, a Launch Control trailer, and a Missile Tracking Radar are included in the park. An article by Colonel Stephen Moeller, first published in ADA Magazine. This is the history of the United States Army Air Defense Command (ARADCOM) and its role in protecting the continental United States during the Cold War. 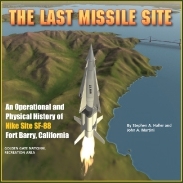 It provides excellent information on the Nike Ajax, Nike Hercules, Nike Zeus and Anti-Ballistic Missile weapons and systems. 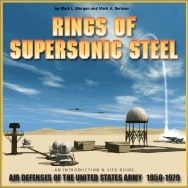 Rings of Supersonic Steel: history of United States continental air defense during the Cold War. 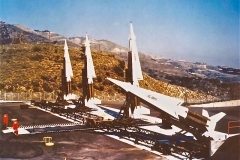 Provides detailed information about each Nike missile site in the United States (including Hawaii and Alaska) and Greenland plus a general history on the Nike missile system and several competitors. The Last Missile Site: Go inside a Nike missile site! View the inner workings and relive the day-to-day operations. Told through the eyes of the men and women who stood ready at Site SF-88, THE LAST MISSILE SITE paints a vivid picture of the around-the-clock military mission that protected our nation from aerial attack during the tensest years of the Cold War. Nike Ajax and Nike Hercules Ordnance Support units. Click to this site to see Nike pictures, Nike stories and a "find them" roster of former Ordnance Support unit personnel. Note: NikeOrdnance is now maintained by the Nike Historical Society. A site developed by a member of the Belgian 13th Missile Wing, which is at majority, a French-speaking wing. An association was created in 1989 by Major Jean-Marie DE BLENDE. Ed Thelen's site presents a great deal of Nike Hercules historical, technical and operational information and provides extensive links to Nike related books, documents, museums and to other Nike related web sites. This site also provides a photographic tour of Nike site SF-88 (being restored), location and status of Nike sites, and a List of Nike People, some on-line documents, a bulletin board, a search, a Photo Exchange, an FAQ, and a variety of other features. US Army Nike AA Missile Base Bristol, Rhode Island, a great history of a Rhode Island site. E Battery 4th of the 44th, then 2nd of the 44th, Kimje Korea. How it was then and how it is now. 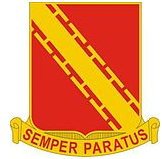 Part of the 38th Artillery Brigade in Korea. Better known today as a United Nations Peace Keeping Force. Where 13 months seemed like a lifetime, especially after the Pueblo was captured! Nike Battery PH-32 in Marlton NJ. "A piece of Cold War history in Evesham's backyard." Missile Site C-41, Promontory Point Jackson Park Chicago "Chicago has become the best defended city in the Middle West against enemy air-to-ground attacks." Nike Missile Sites of the San Francisco Bay Area. As they are now. By Jef Poskanzer. Fort MacArthur Museum. Nike Missile Sites in the Los Angeles area. Granite Historical Society. Granite Nike Missile Base BA-79. The Safeguard Anti Ballistic Missile System. This system was the replacement for the Nike System. It was activated and deactivated in a matter of months due to the ABM Treaty. Europe Defense Veterans of America. An honor association of veterans who defended Europe during the Cold War. Point of interest for all the Nike Vets who served in Europe or were assigned under NATO. A very comprehensive look at Nike sites in Alaska. Site Point Alaska. Fort Bliss Texas: the Army Air Defense Training Center. Who can forget the radar park where the 16C's were trained and weeded out! On the day you graduated from AIT hearing those immortal words, "you might as well forget what you have learned here since it's all going to be different when you get on site." You were told that you were the "best of the best", and probably so! For all you young men and women out there thinking of going into the military, think of air defense, that is, if you're good enough! 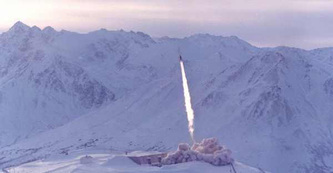 White Sands Missile Range is an important link to this website. It's the test stand where the weapons proved their salt. The Cold War Veteran's Association's web page. Chronicles of Georgia Nike sites (1960 – 1966) done by civilian and Nike enthusiast Ken Turner. Epiphany A book written by Gary Stephens, Nike Veteran and Nike Historical Society member. Restoration of a Nike Missile Site to shoot down astroids. Site Tare or A-2-562 was one of 5 Nike Hercules Batteries that surrounded the Fairbanks/Eielson AFB. White Sands Missile Range Museum - Browse through the history of missile testing at White Sands Missile Range, New Mexico, to include the Nike Ajax and Nike Hercules. see also NIKE Missiles & NIKE Missile Sites - History and information on the New York and New Jersey NIKE Missile sites with links and specifications. 30th Brigade (ADA) Okinawa - A website dedicated to Air Defense on Okinawa by Joseph J. Villademoros. It is a growing website, so visit and make your contribution to the memories and knowledge of Air Defense on Okinawa. Col (Ret) George Evans' LA-78 Photos and His photos of the Fatal New Jersey Nike Ajax Site Accident - Col Evans was the Battery Commander at Nike site LA-78 in 1966 and later on the Battalion S-3. LA-78 had some prime scenery and the photos capture this in a spectacular way. And, most who served for any period with Nike, have heard of the tragic accident that happened at the Leonardo, New Jersey Nike Site. The photos capture the distruction and horror of what happened there. Fort Bliss Air Defense Artillery School is the home of the US Army Air Defense. All Nike operators and site maintenance personnel were trained at Fort Bliss. Additionally, all the Nike units deployed throughout the world were received their unit training here. JP Moore's Red Canyon Range Camp website is dedicated to the men who lived and worked at the camp. JP has put together a photographic story of the Camp and the people who lived and worked there. He has collected photos from several sources and is a must see for those interested in the history of Nike and Air Defense. 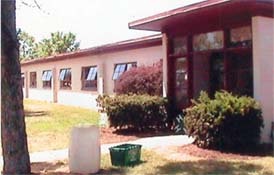 Bill Shaw's Bristol, Rhode Island Nike website has lots of photos of the site over the years that it was operational. It has photos of the area, equipment, and people who served there. There are also several interesting stories written by some of those who were on guard around the clock for many years. A great website to understand life on Nike sites around the country and the world. Danny Carter's web page is dedicated to the veterans of B Battery 2nd Bn 56th ADA (Bravo). Bravo was a Nike Hercules missile site located in Landau i.d. Pfalz (1957-1983) on a hill called Ebenberg. Bravo is now dismantled and abandoned, but not forgotten. Bill Momsen's Installing Nike Hercules Missiles in Alaska gives a narative and pictorial look at the beginning of Nike Hercules at Site Summit, Alaska. Jeral Sexton's Site Summit, Alaska - Nike Hercules - ADA "B" Battery History website documents the Nike Site, which was on the "The last frontier." "The land of midnight sun." "The last state to deactivate the Nikes." The site was located in the rugged, mile high Chugach Mountains. Northpoint Kaserne, Kriegsfeld, Germany a website for the 619th Ordnance Company, 23rd Ordnance Company, 571st Ordnance Company, 554th Military Police Company, 558th Military Police Company, 184th Ammo Company 2nd Platoon, 763rd Medical Detachment, Company E 102nd Signal Battalion, and Tech Site Three located at Northpoint Kaserne. NIKE Missile Sites in Indiana - The defense of Chicago was vitally important to US Military planners, and NIKE missile sites were built in Indiana to defend Chicago and Gary, IN. 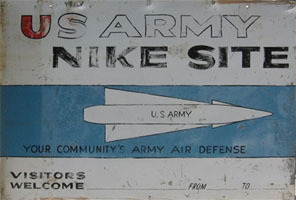 Meanwhile, in southeast Indiana, NIKE bases were built to defend Cincinatti and Dayton;This site includes information and maps on all Indiana NIKE Bases, photographs and reports on the current conditions of some of the sites, and information on the NIKE Preservation group, an Indiana group trying to designate NIKE Site C-47 as a historic landmark. The Detroit-Cleveland Defense Area NIKE Missile Page - Created by Tom Bateman, this page includes the history and information on the NIKE sites built to defend the cities of Detroit, MI and Cleveland, OH. According to the site, it will also contain the history of ARADCOM and of the NIKE missile program. Detroit and Cleveland had their own separate defense areas until 1968. 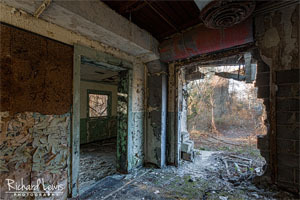 Tom Vaughn's recent pictures of abandoned US Nike bases. Also there are some vintage pictures of Nike people and bases. Link to German History of NIKE Ajax / Hercules - This site was developed by Rolf Goerigk, a former maintenance man of a German Air Force Nike unit. Rolf has assembled a lot of the history of Nike in Germany, manned by all nations. Lots of information and memories here! Belgian Air Force Nike (French) - Daniel Rossion says his Nike website is "mainly for NIKE French-speaking friends and freaks." But, he does have some English material and all the photos are universal. Belgian Nike Air Defense (Flemish) - Christian Van Hevele has produced a website using the other Belgian launguage, Flemish, but a part is in English also. This site is meant to be a remembrance, in respect of the people who served in the units of the Belgian Nike and took part in the history of the Belgian Air Force! If you are interested in having your web site added as a link, please contact the webmaster.